It’s not all bad news when it comes to the country’s latest consumer price inflation, which surged to a near-decade high of 6.4 percent in August. 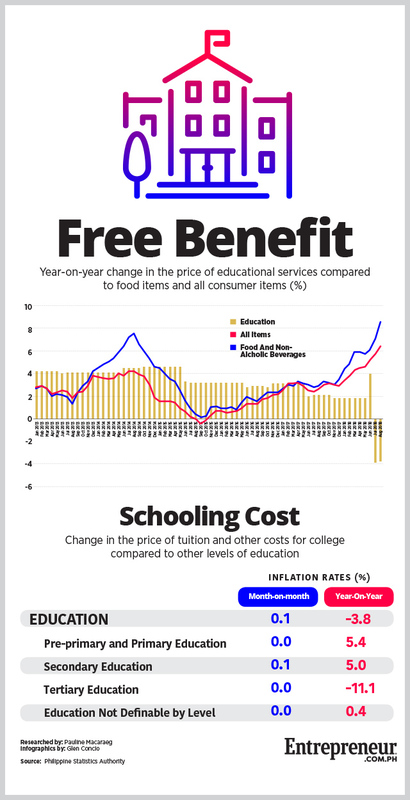 Though most of the commodity groups that made up the consumer price index (CPI) went up, led by good and non-alcoholic beverages, at least one expense item’s price index fell: education. The education price index declined by 3.8 percent from year-ago levels in August, following a similar drop in July, according to the Philippine Statistics Authority (PSA). That’s the first time since at least 2013 that the education price index fell rather than climbed. A closer look at the various segments of the education sector showed that tertiary education costs fell by 11.1 percent in August from the same month last year. That’s mainly due to the implementation of the new law granting free tuition to all tertiary students in all state universities and colleges. President Rodrigo Duterte signed the law, Republic Act No. 10931, or the Universal Access to Quality Tertiary Education Act, on August 3, 2017. It was implemented starting academic year 2018-2019, which explains the decline of year-on-year consumer prices on the education sector since July this year. Related story: Which State University Students are the Biggest Beneficiaries of the Free Tuition Act? Because the law covered only college students enrolled in state universities and colleges, the cost of going to pre-primary, primary and secondary schools still went up by 5.4 percent and 5.0 percent, respectively. With prices of most commodity groups going up, even government statisticians, it seems, weren’t prepared for the idea of education costs going down. According to a report in the Philippine Daily Inquirer, the PSA failed to take into account the government’s free tuition fee law and estimated that the education price index went up rather than down. The figure was corrected but only after a bit of a delay in the release of the closely watched CPI numbers.